After losing friends while serving his country, Sergeant Brody Wilson shut himself off from the world. Enter beautiful Mary Carter, his brother’s former girlfriend, and her adorable infant son. Despite his best efforts, Brody can’t close off his heart to beautiful Mary and little Elliott. But will pushing them away cost the wounded warrior the family he’s always dreamed of? One of the (many) things I enjoy about Carrie Nichols' books is the fact that she doesn't shy away from difficult issues. 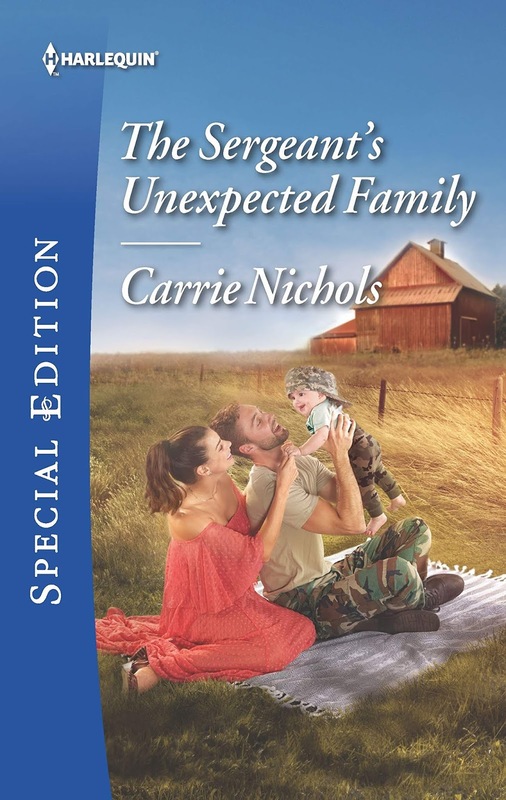 The Sergeant's Unexpected Family is no exception. With a deft hand, Nichols brings together a former soldier who has practically become a hermit in his quest to escape the pain of war with a strong, resilient woman in search of a community where she can build a home for herself and her baby. He would prefer never to leave his farm and the animals he's taken in there while she jumps on every opportunity to make friends and become part of the town where she's landed. Then there's the fact that Brody's presence is the very reason she's come to little Loon Lake, Vermont. Mary's son was fathered by Brody's half-brother, a man who wants nothing to do with either Mary or their child, a man from whom Brody is estranged. That's fine by Mary. She had already clued in to the man's true personality and stopped dating him before she discovered she was pregnant and, financially, she can support her child without his help. But Mary has no family and if something were to happen to her, her son would have no family. She wants Brody to know his nephew. She's there to form connections with Brody for her son. She never expected them for herself. Carrie Nichols really tugged my heartstrings with this story. I so enjoyed watching Brody slowly begin to open up to both Mary and Elliott as well as others in town. The scenes between Brody and Elliott made me want to wrap my arms around both of them. So sweet. And Mary and Brody are perfect for one another though it takes time, and overcoming a few obstacles, for that to become apparent. I like that Nichols gave them that time, and the space, to grow their relationship and overcome the emotional hurdles standing in the way of a happy ever after. I like her ability to pull me into a story and into the hearts and minds of her characters. I feel as if we've become friends and I'm traveling this journey with them. It's a feeling that brings me back to her books, again and again. 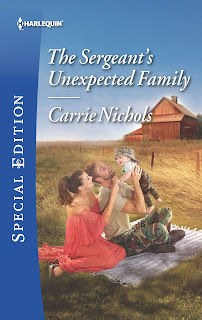 If you enjoy emotionally satisfying small-town romance that leaves you smiling with joy and eagerly looking forward to more, give Carrie Nichols a try. You have given me another gift. This story calls to me on so many levels. Thank you. I know several veterans who found it difficult or impossible to readjust to live back home in "normal" times. Many of them find it difficult to be around others or aren't good company when they are. Some will return to their old lives, but can't handle it. This sounds like an excellent exploration of someone copying the best he can and how lives can be changed for the better. Thank you for the review and recommendation. Patricia B. Thanks for the review PJ. Sounds like my kind of read.